A weekly treatment to refresh and renew weak hair. 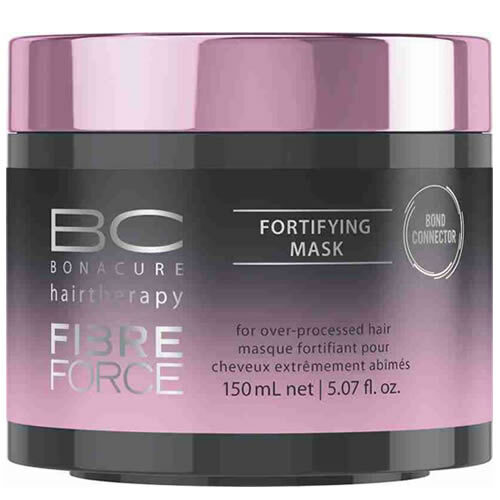 Schwarzkopf Professional BC Bonacure Fibre Force Fortifying Mask is an intensive and rich treatment that uses a combination of 2 complexes that seals the cuticle of the hair and gets to work repairing from the inside out. This can offer hair up to 10 times more resistance to breakage. This is thanks to the product's patented ‘Bond Connector Technology’. 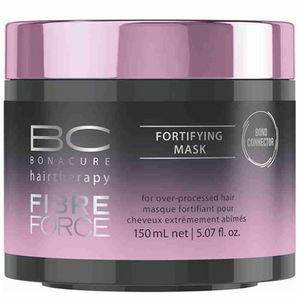 This mask is perfect for clients with extremely weak hair as it will revitalise and strengthen as well as restoring their hair's natural shine and vitality. Simply apply to mid-lengths and ends of towel-dried hair and comb through your clients' hair and then leave it to work for 5-10 minutes. You should then rinse thoroughly. £11.94 (inc. VAT) Why no VAT? We're a trade wholesaler and quote our prices without VAT to help our VAT-registered customers understand the true cost of a purchase. A highly-nourishing leave-in conditioning spray that will protect hair from colour and heat damage and give a beautiful shine. A leave-in milk sealer that will restore hair and leave it rejuvenated and stronger than before as well as beautifully shiny. A lightweight, creamy shampoo that gently removes excess oil from over-processed hair and strengthens each individual hair strand. Comes in 200-ml or 1000-ml bottle. Reduced to clear! Last few remaining of 200 ml in old packaging. Save 25%! Intensive pre-shampoo treatment that works with bonding cream to offer hair regeneration and improved appearance for over-processed hair. Comes in 12 x 10-ml tubes. A leave-in keratin–concentrate hair serum that deeply reconstructs and seals each individual hair strand to offer great protection. Reduced to clear. Last few 200-ml bottles in old packaging. A rich, creamy conditioner formulated with balancer technology designed to lock in colour and care for colour treated hair. Comes in 200 ml or 1 litre. High quality backwash pump designed to fit Schwarzkopf BC Bonacure, Indola Innova and Clynol backwash bottles of shampoo, conditioner and hair treatment. Features a sturdy spring mechanism for a reliable action. Comes in 2 sizes: 750 ml and 1 litre/1.5 litres (depending on brand).